This anthology is about serial narration on television. 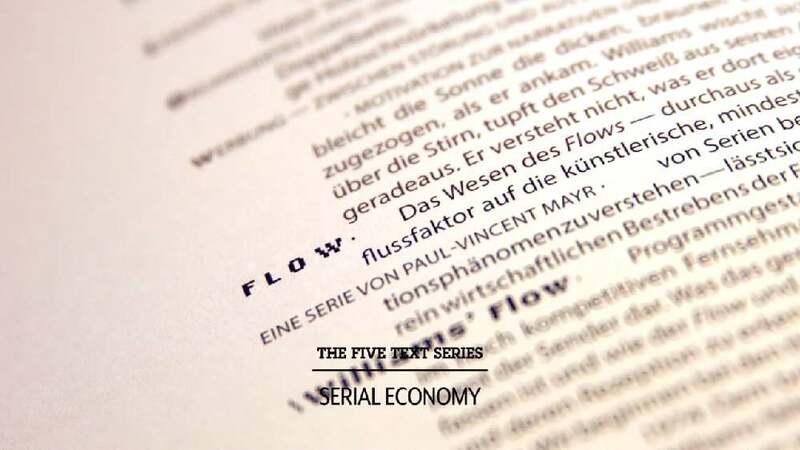 The book is an approach to explaining the aesthetic, discursive and historical dimensions of seriality by simulating it: every text series — there are five, written by five authors — comprises several episodes which flow into each other as they do on TV. These series use elements like cliffhangers and intros, which are visualised by typography within the layout. Every page of this book is separated into an inner and an outer side. Every text series uses a certain font, hence there are no headlines or paragraphs. Sometimes two episodes become interlocked to emphasise the flow. The minimalistic emblem on the monochrome cover consists of punctuation marks symbolising serial narration.